If the first season of Michael Connelly’s Hieronymus “Harry” Bosch adaptation for Amazon was focused on establishing its central character as the same cop fans fell in love with on the page, then Season 2 seems focused on bringing as many of those pages to life as possible. While Amazon’s “Bosch” never billed itself as a show that would stick to one novel per season — in fact, the interweaving of multiple literary arcs into each other only makes this L.A. story more realistic — its first offering felt more deliberately focused on letting Harry be Harry (or, more to the point, installing Titus Welliver as Harry). Connelly, the creator, writer and executive producer, was willing the audience to accept this person as the real deal; both a representative of authentic po-lice as well as the detective everyone pictured in their minds while reading his dozens of written adventures. Much of this was accomplished by allowing Bosch to exist in the meticulous nature of police work, and thankfully that element is still a major factor in the new season. But with the foundation now firmly set — virtually everyone agrees Welliver is the epitome of all things Hieronymus — Season 2 is kicking things into a higher gear. In the first six episodes of the 10-episode season, a number of new mysteries are put before the obsessive mind of our protagonist, including staples of the police noir genre involving dirty cops, a mysterious damsel (Jeri Ryan) and a “this time it’s personal” storyline. There’s also a renewed focus on some of the supporting players from last season, most notably Lance Reddick’s Deputy Chief Irvin Irving and his son, George (Robbie Jones). It all comes together to form a slightly faster and equally meticulous sequel season, with the combination of last year’s attitude and this season’s drive resulting in a couple of bumps, but an altogether engrossing — and gorgeous — new entry. Picking up six months after the events in Season 1, the events of Season 2 function as a fresh start for anyone who missed (or forgot, after bingeing too quickly) the first 10 episodes. Bosch returns from a suspension, briefly commenting on what got him there (shoving a superior officer through a glass window) in order to keep things current for viewers, but barrelling forward with current plots to immediately grab interest. 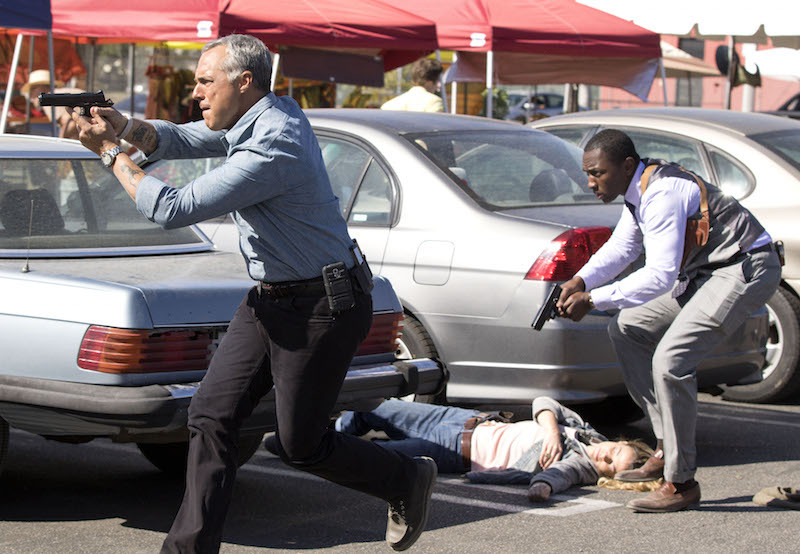 A dead body is found in the trunk of a car parked in the Hollywood hills, leading Bosch and his partner Jerry Edgar (Jamie Hector) to the wife-turned-widow, Veronica Allen. Alone in a giant mansion, Veronica wanders around in flowing lingerie and tight bathing suits, never expressing much emotion or alluding to knowledge of anything at all. Her continuous presence leads to suspicion, but even the apparent twists spread carefully throughout the early episode of this season are hard to see coming. And that’s largely a credit to Connelly’s excellent novels. Loyal readers will immediately recognize notes of “Trunk Music,” but elements from “The Drop” and “The Last Coyote” (the author’s favorite of the series) also find their way into the new season. Occasionally, the combination of plots and the resulting need to conclude arcs quicker creates a bit of clunkiness in the overall flow of the series, but “Bosch” seems to be working toward an improved balance between accurately representing the demands of detailed police work and the excitement necessary in turning these authentic lives into entertainment. It may not find its exact stride until next year, but the learning curve is far from disruptive. More importantly, watching Detective Bosch take on multiple cases simultaneously — especially when he chooses to prioritize one over the other — helps the series feel like it’s really building something epic, or at least bigger than the one-off, episodic structure of older, out-of-date cop shows. Combined with the beautiful cinematography by Patrick Cady and Paul M. Sommers (both of whom worked on another stunning and grounded drama — SundanceTV’s “Rectify”), these elements help “Bosch” stand apart from the dense pack of competitors. Granted, the dialogue can occasionally feel a bit forced and the core characters are very much grounded in a different era of police perception, but neither are marked hindrances to what makes the Amazon drama worth watching. It’s still all about Harry Bosch. Now, he’s just getting more to chew on. “Bosch” Season 2 is streaming now on Amazon Prime.